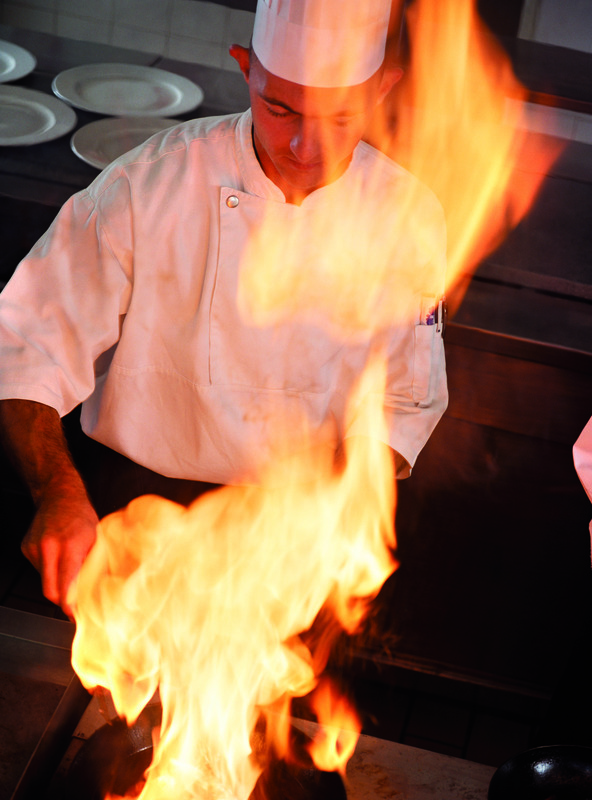 The biggest fire hazard in a restaurant or catering area is its kitchen. In the last year, the media has reported kitchen fires at some of Australia’s top restaurants in both Melbourne and Sydney, causing large scale evacuations mid service and destroying property and equipment. Fire hazards exist in every building, regardless of size or purpose, however commercial cooking environments can be highly combustible due to intense cooking heat, and highly flammable oils and grease lining inaccessible exhaust ducts. While most restaurant fires are relatively small, they can still have an enormous impact on the business in terms of loss of revenue and staff retention, repairs and the cost of replacing cooking equipment. For fine dining establishments, the cost of replacing a wine cellar can exasperate the devastation, particularly if the cellar contains irreplaceable bottles of vintage wine that can be valued at many thousands of dollars. If you’re responsible for managing a commercial kitchen or restaurant, there are four key considerations to think about when assessing the risk of fire and the impact it may have on the business. Protecting people and property – most importantly, consider staff, patrons and proximity to neighbouring or adjoining dwellings and businesses. Protecting revenue stream – the ability to rebuild or re-open quickly after a fire can be compromised due to the high costs and time involved. Protecting insurance claims – ensure your policy adequately covers your premises, and fire protection equipment in place complies with building regulations and ongoing maintenance and training requirements, to protect the value and validity of claims after an incident. Protecting reputation – serious incidents can impact customer confidence and loyalty. Being out of business in the highly competitive restaurant market for a period of time can also have a devastating effect upon return of trade. The best defence against fire is having an appropriate fire suppression system in place and there are a number of solutions that are specifically designed for commercial kitchens. For small café and restaurant kitchens, Wormald recommends installing wet chemical portable fire extinguishers and fire blankets. For larger commercial kitchens, the ANSUL® PIRANHA® system, an agent-plus-water fire suppression system which is designed for kitchens using high temperature cooking oils (in conjunction with portable fire extinguishers and fire blankets), is ideal. It uses a patented liquid fire suppressant followed with water to provide rapid flame knockdown. Once installed, any equipment and fire protection systems on site should be regularly serviced and employees should be trained in how to use them. Training is a vital part of fire protection planning and every staff member should be briefed on a building’s evacuation procedures and how to react in the event of an emergency. If regular fire safety training is conducted, employees are equipped to execute emergency fire safety plans and procedures at all times, helping to achieve safer outcomes for staff and patrons as well as minimising damage to property. I appreciate fire protection planning may be overwhelming, with many codes and standards to adhere to. It is therefore a good idea to engage with a fire protection specialist to help identify the hazards and advise on the most appropriate solution.